One thing your iPhone could be better at: sending secret encrypted messages (aka for sexting and/or illicit relationships). The regular messages app leaves everything hanging out in the open! Text Fortress is an app that encrypts the messages you send and locks them down so only the person you sent it to, can see it. The way it works is a lot better than previous apps that encrypted messages sent on the iPhone because it's so much easier to use. 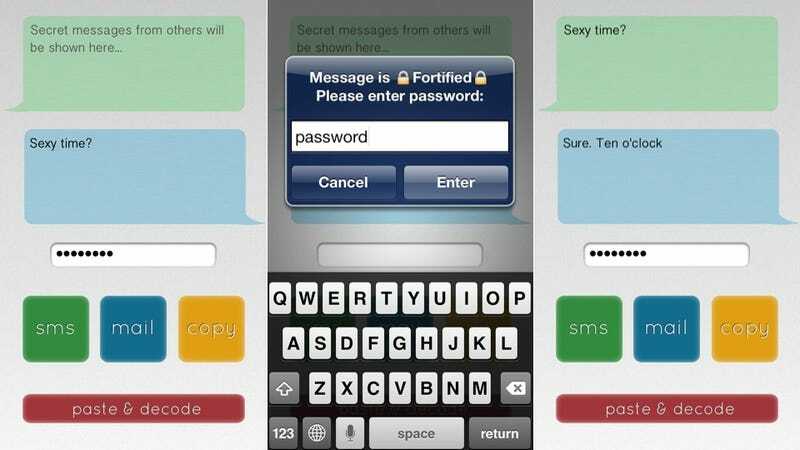 With Text Fortress, encrypted dirty texting is pretty much self explanatory. When you fire up the app, you'll see a text box, a password field and the option to send it via text, email or notes. Basically, after you type in your secret text message and lock it with a password, you pick how you want to send it and Text Fortress will automatically open the corresponding app (messages, email, notes) with a link to your hidden message already in each app's text box. All you have to do is hit send.